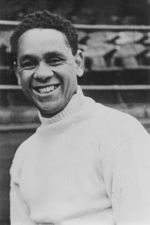 When Tommy Best joined Chester at the start of the 1947/48 season he became the first coloured player to represent the club in the Football League. A late entrant into the professional game Tommy was 26 when he made his League debut against Oldham and marked the occasion by scoring a goal in a 2-1 victory. During the war years Tommy had played in Ireland for Belfast Celtic and Cliftonville, he also represented the Combined Services and played for a short time in Queensland, Australia. However, when Chester offered him a trial he was playing for his home town club Milford Haven in the Welsh League. In his first season at Chester Tommy made 30 appearances and scored 10 goals with most of these coming in the second half of the season when he established himself at centre forward. He recalls that in those days he was playing alongside Tommy Burden and Tommy Astbury both of whom he speaks highly of. Othe players he remembers from that season are goalkeeper Scott McLaren, Dave McNeil and Frank Marsh. Of his own game Tommy reckons his strong point was his heading and believes that the only player that could get the better of him was John Charles. The game that stands out most for him was a 4-1 home victory over Wrexham when he scored one of the goals in front of 14,000 supporters at Sealand Road. By the start of the following season Tommy was beginning to attract the attention of the bigger clubs and he recalls that Blackpool, Blackburn and Cardiff were all interested in signing him. In the end he decided to join Cardiff because it was near his home town. Tommy says that Chester received £7000 for him which remained a record fee until Billy Foulkes joined Newcastle United in the early 1950s. He remained at Cardiff for just over a season before joining QPR in 1949. After leaving QPR Tommy returned to Milford Haven and later joined non-league Hereford United where he remained for three seasons. This was followed by a season and a half with Bromsgrove Rovers before he left football and worked as a baker for Mothers Pride. At the age of 88 Tommy now lives in Hereford where he is still a keen football follower and visited Chester for the first time in 60 years to watch the home game against Gillingham.